Our letter of the week is "O". We have had an "accidental" number of the week, "8". We discovered that an Octagon has 8 sides and Octopuses have 8 legs! Connections are everywhere! so I shook that tree as hard as I could! Down came an olive! mm mmm good!" "Where did the olives (or apples or cherries....) go?" and they respond "We ate them!" Morah Katie: Where did all the olives go? The Children: We ate them! 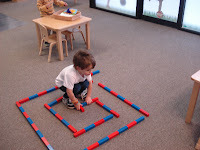 For a child to refine his/her small motor control, they need to have a quiet and calm body. Large, full body movements can assist this process. This is one reason why movement is encouraged in the classroom, from balancing on a string of yarn to sweeping up scraps of paper. 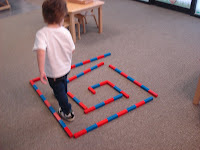 Large, involved movement allows the child the opportunity to refine his/her gross motor and fine motor skills, as well as test and expand his/her capabilities. 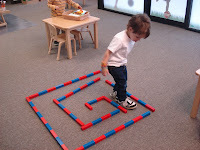 Kian took out all the red and blue rods and created a maze. Levi and Daniel are exploring what happens when you add the red and blue rods together. They collect and gather to add. The movement involved allows their active minds to stay engaged and challenged. I would like to begin a sharing circle on thursdays. This provides the children a chance to share something unique and special to them. Each child will be given the opportunity to explain why the object is special; their friends will have an opportunity to ask questions. Thank you for continuing to make a not e of the mitzvahs your child is doing at home, combined with the ones written about at school, our tree is delightfully pear heavy! This week we began to learn about the parts of the tree. Morah Katie: What part of the tree gathers the water from the ground? Morah Katie:Where would we look to find the roots? We talked about the trunk of the tree, and how it supports the branches and leaves. We used our handprints to create the protective bark on our tree. We created branches on our tree and looked at the bare tree outside. We compared how the bare branches look like the roots, an upside down tree. One of the benefits of having a mixed age classroom is the variety of ages and abilities. It is almost guaranteed that each child will have the opportunity to help another. Daniel knows that Noam likes the numeral cards, Daniel is helping Noam learn "1". The older children have opportunities to be leaders, and the younger children have role models to look up too. The children learn to work together forming a community, appreciating what they all have to offer. The children are looking forward to Shabbat dinner with their preschool friends and families. We have been singing songs to share and creating keepsakes to keep after dinner. Our letter of the week was “n”, we made Necklaces with Nine beads. It was an exciting discovery to realize we were creating Napkin rings for Shabbat dinner. I have enjoyed having the opportunity to meet and talk with you about your children. If we have not yet had an opportunity, I am happy to schedule a time to meet. See you all tomorrow at 5:30!